Although it is not obvious, there is an extremely intricate ecosystem that is centered right at the shoreline where the waves crash on the beach. It is called the surf zone. The rush of foaming water that comes up the beach, called swash, brings small, tasty critters to the surface. The little clams that you see burrowing back into the sand after the water rushes back are called surf clams or coquina. 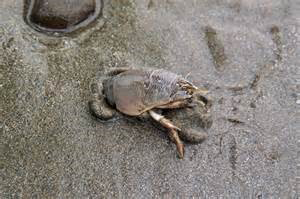 The small crabs that people dig for by the waters’ edge are called mole crabs. Many shorebirds like the Piping plover and sanderlings depend on these critters that are left exposed by the rushing water. Human intrusion, pollution and erosion have a very large impact on sandy beaches and sand animals that live there. 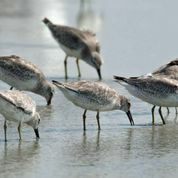 Humans, without even knowing it, are competing with many shorebirds for precious space along the beach. 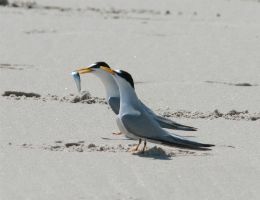 It is important to preserve beaches used as nesting sites by shorebirds and to limit disturbance of their feeding grounds. In addition to the surf zone, some species of shorebirds and other creatures live and hang out along the back beach safe from the water. For example, ghost crabs live in small holes they burrow in the sand. They tend to feed at night and burrow closer to the water. 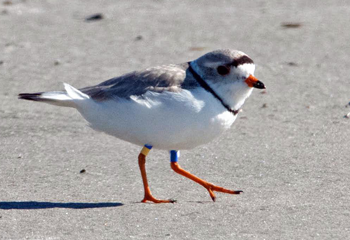 Piping plovers find nesting areas in the flat sand farther away from the water. Their nests are particularly vulnerable and easy to miss because they are on the ground and the eggs are camouflaged to look like broken shells and pebbles. 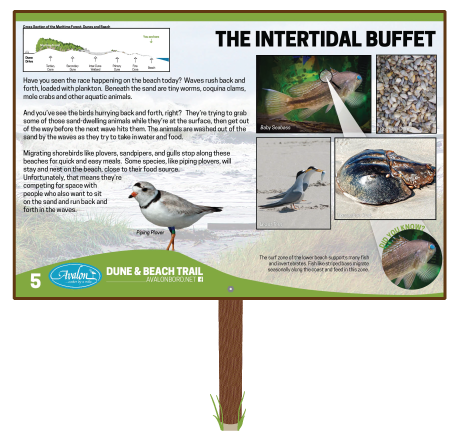 Learn more about The Intertidal Buffet by walking the beach and observing the feeding activities of shore birds.